November 30, 2010 - Boeing and Brussels-based Jetairfly celebrated the delivery of the airline's first Next-Generation 737-800 with the new Boeing Sky Interior. 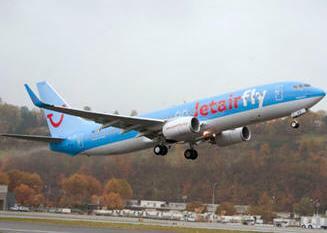 Jetairfly, part of TUI Travel PLC, the largest tourism group in London, is the first European-based airline to operate a 737 with the new passenger-inspired interior. "The 737's operating and environmental performance continues to make this airplane a valuable asset to our fleet," said Elie Bruyninckx, chairman of Jetairfly. "We continue in our efforts to reduce our carbon output and improve the flying experience for our passengers, and we are proud to be the first airline based in Europe to operate with the new Boeing Sky Interior." The 737 Boeing Sky Interior features new, modern-sculpted sidewalls and window reveals, larger stow bins and more headroom around the aisle seats. Other features include a quieter cabin, intuitive placement of switches and call buttons, improved sound quality and different interior lighting schemes. "We congratulate Jetairfly on the delivery of its first 737-800 with the new Boeing Sky Interior," said Marlin Dailey, vice president of Sales & Marketing, Boeing Commercial Airplanes. "Jetairfly's incorporation of the Boeing Sky Interior and its passenger-pleasing features will reinforce its position as Belgium's leading holiday airline." The Boeing Sky Interior is the latest in a series of improvements to the airplane. Since the Next-Generation 737 was introduced in 1997, customers have taken advantage of continuous improvements to this best selling airplane that have made it even more efficient, reliable and passenger-friendly. Next to come will be a package of performance improvements that will reduce fuel consumption and carbon emissions by 2 percent ? making the airplane a full 7 percent more efficient than the first Next-Generation 737 delivered. The performance improvements to the airframe and engine will be in service by early 2012. To date, 50 customers have ordered the new interior for 1,386 airplanes. Jetairfly is a low-cost airline with its headquarters in Ostend, Belgium and its centre of flight operations in Zaventem, Belgium. It operates scheduled and charter passenger flights. Formerly known as TUI Airlines Belgium, it adopted its new name in November 2005. Jetairfly is a part of the largest leisure fleet in Europe, together with seven other airlines which are linked together by the virtual alliance TUI Airlines, which is a part of the TUI Travel PLC Group, the largest tourism group in the world. TUI Airlines groups Jetairfly, Arkefly (Holland), Corsairfly (France), TUIfly (Germany), Thomson Airways (United Kingdom), TUIfly Nordic (Sweden) and Jet4you (Morocco) with a fleet of more than hundred aircraft. Since March 2004, Jetairfly has operated to more than 70 airports in the Mediterranean, Red Sea, Caribbean, Canary Islands and Africa. The airline's home base is Brussels Airport, but flights are also operated from Liege Airport, Ostend-Bruges International Airport and Brussels South Charleroi Airport. The airline carries hundreds of thousands of passengers annually and is the second largest airline in Belgium.